Russian promise Nikolay Gryazin scooped a maiden FIA ERC Junior Under 28 championship title* on Rally Liepāja, while a titanic scrap between Fredrik Åhlin and Fabian Kreim for third provided a fantastic sub-plot. Starting the day with 19s in hand over nearest championship rival Chris Ingram in second place, Gryazin, 21, won all three stages during leg two’s morning loop, creating an unassailable lead of over half a minute which he would not relinquish during the afternoon. As both Gryazin and Ingram switched to a safety-first mode to secure their first and second place finishes – and the same positions in the overall championship standings – an extremely close battle over third came to a dramatic climax on the championship’s final stage of the year. 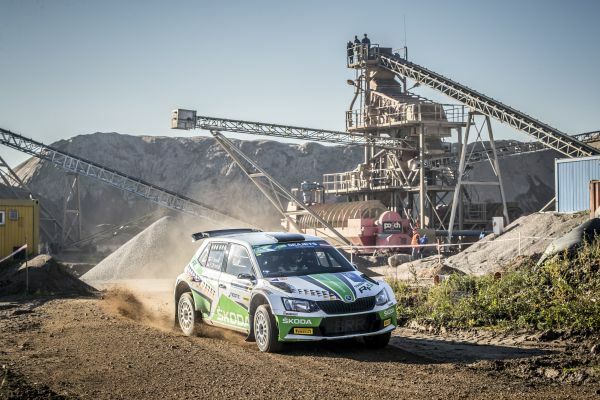 Locked in battle since Saturday morning, ŠKODA AUTO Deutschland’s Fabian Kreim and CA1 Sport driver Fredrik Åhlin entered the final stage – the longest of the rally at 24.99 kilometres – separated by only 0.1s. Each had set the fastest time of anyone on SS11 and SS10, respectively. Such was the intensity of their battle both had closed up on Ingram, with Kreim only 13.7s behind in his own battle to take second in the championship from Ingram. However, after throwing his ŠKODA Fabia R5 off into a ditch at high speed and coming only centimetres from rolling over, he reigned in his pace, while Åhlin pushed on at full speed. Åhlin’s margin of victory on the final stage was 8.1s over the new ERC Junior U28 champion* and 8.3s over Kreim, demoting the German driver to fourth place. 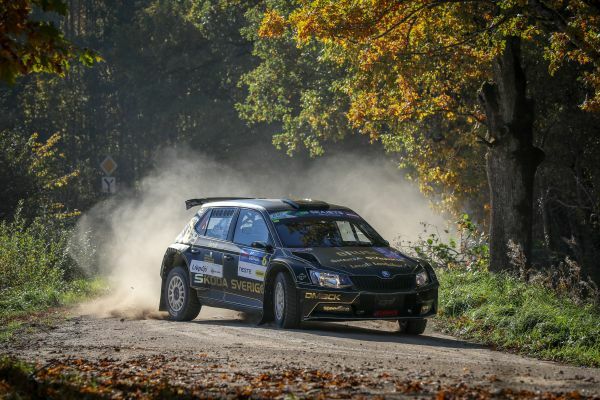 Autoklub of Czech Republic-backed Filip Mareš completed the top five young stars in R5 cars, steadily improving his pace across the weekend and improving from seventh to fifth by the rally’s end. It was the ERC Junior Under 27 graduate’s first career top five finish in the ERC Junior U28 category. Kresta Racing's Rhys Yates admitted he had underestimated the challenge of Liepāja’s lightning-fast roads but gained valuable experience in improving his pace notes and the positioning of his car, with sixth place his reward for successfully navigating a rally which had caught out many others. Laurent Pellier had been sixth at the end of leg one but technical issues forced PEUGEOT Rally Academy to retire his car on Saturday evening, electing not to restart and take part in Sunday’s action.